There are events that take place in your lifetime that you remember as if it happened only yesterday. You vividly recall where you were and what you were doing and you remember it for the rest of your life. Events like 9/11 - I'll never forget where I was (at work), who I was with (close friends and co-workers) and how I felt - how we all felt as the events unfolded (stunned, shocked, in disbelief). And so it will be the same with regard to the horrible, senseless and tragic massacre that occurred at the Sandy Hook Elementary School on December 14, 2012. It was a beautiful day; bright and sunny, the air cool and crisp. I stopped at my boyfriend's house on the way to work to pick up his mail since he had been out of town all week and was in fact, returning later that day. I remember hearing a helicopter, looking up at it and thinking to myself, how odd that it was black and flying so low. Mind you, the "event" hadn't happened yet (still over 40 minutes away), so it was probably just flying around over the highway or perhaps coming in for a landing at nearby Danbury Airport. I continued on to work and was doing the usual work stuff in the office, but I was also tracking my boyfriend's flight which was en route from Austria to JFK. My friend and co-worker had just returned to his desk which is next to mine and shouted over the partition asking if I had seen the online bulletin which had been released from the head of our HR Department, alerting us to an "event" that had taken place in Newtown. I had not. The bulletin mentioned something about a shooting in Newtown and provided a link to the developing news story and instructed people to leave if they felt they needed to leave. My company never advises leaving. Hardly ever, unless it's a state/government mandate due to a weather emergency or something, so we knew this was big. Indeed, a shooting had occurred at an elementary school in Sandy Hook. My thought immediately went to my friend who has a daughter that attends school in Sandy Hook - thankfully she attends a different school. However, her school, as well as other schools throughout the area were in lockdown. How horrible to be a parent and not be able to get to your child in the midst of this chaos and developing horror, which in the beginning, was fraught with confusion, and constant twists and turns as the story continued to unfold. (Similar to 9/11... at first we heard a small plane had hit one of the towers, only to find out it was an airliner. And then a second plane crashed into the second tower... and well, we know how that unraveled. Images that will haunt our memories forever). So, in similar fashion, the events that took place in Sandy Hook on December 14 slowly unfolded. Most of us were watching livestream news on the internet. At the end of the day, twenty little first graders and six administrators/teachers were killed. Of course, the Sandy Hook event dominated the news but also on that same day in China, 22 little children were slashed with a knife as they were on the way to their elementary school. By mid-afternoon, my boyfriend's plane finally landed and I emailed him to let him know a shooting had taken place in Newtown. I wanted him to be aware in case the traffic in our area might be affected but I felt I had to clarify by saying this was BIG. Not just any random shooting; but a mass murder. No need for my email though as this news story was all over the world by his time and he was watching it on CNN as he waiting in the line at Customs. It's been surreal. Huge helicopters flying above my house en route to Newtown. The president of the United States visiting Newtown. This type of thing doesn't happen in your own backyard. And most certainly, you would never, ever expect a crime of this magnitude to take place in a town like Sandy Hook, Connecticut. Of course, the Columbine shooting, the Virginia Tech shooting, the Oklahoma City bombing, the Norway shooting - they're all terrible and horrible. But they're somewhere else and while you still feel bad and sad, furious and helpless, there's a bit of distance there. It's a different story when it hits so close to home. So like I said, it's been surreal. And it's been a sad week. When the pictures were posted of those little children, that's when it really got to me. Such sweet little faces, so cute and innocent. They never did anything to hurt anyone. They were just cute little kids - little first graders between 6-7 years old. Gunned down. Forever silenced. I cannot even begin to imagine the depth of grief of losing a child and especially losing them in such a violent, senseless manner. How does a parent face the void left behind by the death of one so young and full of life? Never to hear their child's laughter again. Or play a game together. Or push them in a swing. Or walk hand-in-hand, child between each parent, being lifted in the air. Or watch them grow up to be the human beings they were destined to be. How sad for the parents that during this holiday season, instead of selecting toys, they had to shop for caskets and decide which clothes to bury their child in. How does one deal with something like that? I can't even begin to come to terms with the level of pain those families must be going through. Those parents were just going about their normal day - putting their kids on the school bus or dropping them off at school and then going on to work or whatever their normal routine was on that day only to have their lives shattered in the blink of an eye. How tragic for all the parents and especially those who moved to Sandy Hook for whatever reason brought them there that placed their child in that classroom at that time. On a positive note, the amount of love and support from around the world has been profound. I'm not even directly affected by this tragic event except that it happened in the next town over from me and I have friends who live there, but I'm still so appreciative of all the people and businesses that took time out to write from all over the world. The outpouring of love and concern that flooded Facebook that day was meaningful beyond belief. The Sandy Hook/Newtown community has certainly come together to support each other. People in surrounding communities are doing what they can to help and trying to alleviate their own grief sorrow by building and visiting memorials and donating to the families. Life is a precious gift. Don't waste it being unhappy, dissatisfied, or anything less than you can be. Too often we are so preoccupied with the destination, we forget the journey. Enjoy life. Be kind to each other. 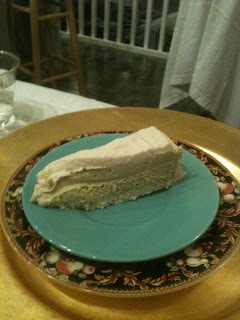 This recipe was demonstrated and served at Chef Renate's home. She is one of the chefs at the Hippocrates Health Institute in West Palm Beach, Florida. Approximately 3 Sundays a month, she and her husband host 10-15 guests to a delightful evening including information on the raw food lifestyle and the various types of equipment used in raw food preparation (juicers, food processors, Vitamix, dehydrators, water ionizers, etc). The night we went, the demo / menu included Mushroom Ceviche as an appetizer and a Garden Herb dressing served atop a bed of organic mixed greens. 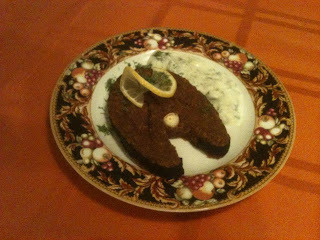 The entree was Faux Salmon Steak with a Caper-Dill Sauce. And the desserts included a most delicious and impressive raw food version of Key Lime Pie and decadent Chocolate Truffles. If you have an opportunity to attend one of her demos, I think you'll find it worthwhile. She is passionate about the raw food lifestyle and takes the mystery out of raw food preparation. The dishes are simple to prepare yet elaborate enough to impress guests and she offered so many wonderful suggestions and variations to style and serve each dish. I'm so glad I went; it was a wonderful evening away from the institute, not that I felt it was necessary to get off the campus, but it was something different - a nice evening spent with sweet friends, good dialog, great information and fantastic food and Chef Renate's husband entertained us with his piano music and singing. Magical night. This is something I would like to do myself someday, so it was helpful to attend a live demo to get real-life tips and tricks. The Mushroom Ceviche was actually the very first raw meal I prepared as soon as I returned from Hippocrates since I just needed to go to the store and pick up the ingredients (no pre-prep required). I had ordered a dehydrator before I left Hippocrates, but I had to wait nearly 2 weeks before it arrived, THEN I could finally make the Faux Salmon Steak! It came out tasting pretty much just like the chef's! Slice the bottom white part of a scallion, about 1/2 inch and stick in the indent (see picture) to simulate the little bone that's in salmon steaks. Garnish with lemon slices and serve with caper dill sauce. Pour dressing into a bowl and stir in diced cucumbers, chopped dill, scallions and capers (the recipe doesn't specify quantity; I used about 1/4 cup of each. Braggs Liquid Aminos can be found in any health food store, usually in the Macrobiotic section or near the soy sauce section. Nori can be found in the Macrobiotic section as well. Finally getting around to posting recipes! 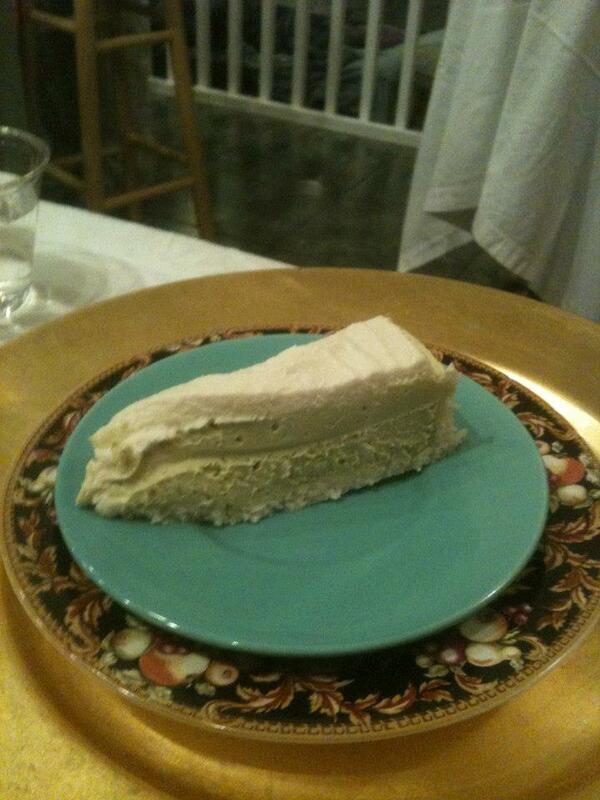 So, this was a recipe that was demonstrated and served at Hippocrates by Chef Renate. She also held a cooking demo at her home one Sunday where she prepared and served a delicious 4-course meal. 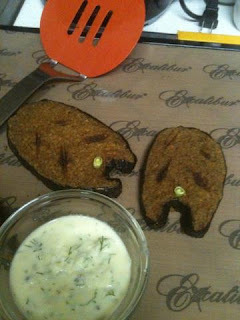 I think I posted the "Faux Salmon" that she prepared on Facebook, but I'll re-post it here as well (in a separate post) since I don't really get how the Facebook timeline works - sometimes I have a really difficult time finding my older posts. Anyway, this recipe was a big hit among those of us who tried it at Hippocrates and it was really quite simple to prepare. The main thing is to be sure to factor in time to soak the sunflower seeds. Soaking seeds and nuts helps to remove the enzyme inhibitors, making them easier to digest. It also makes for a softer texture. Always discard the soak water. I made a batch of this on Sunday and my boyfriend enjoyed it although in all honesty, while it did resemble tuna salad and it tasted good, it didn't really taste exactly like tuna salad; I believe I could have adjusted for this by adding kelp seaweed sprinkles to it to give it more of a fishy flavor, but it was actually delicious as it was so I really didn't feel the need to tinker with it further. It makes quite a bit - we had some for dinner and we both had plenty leftover for lunch for the next 3 days, so I think next time I'll make half of the recipe if it's just for the two of us. This recipe would work well for a party - you could leave it in a bowl and serve it as a pate with celery sticks or you could fill endive leaves or lettuce leaves filled with little scoops of it and served on a large platter. You might also use large slices of red pepper with little dollops of the pate on top. Process in food processor (S blade) until thick and creamy. Put pate in large bowl. Lasts 2-3 days in the refrigerator. Braggs Liquid Aminos can be found in any health food store, usually in the Macrobiotic section, or near the soy sauce section. Kelp can be found in the Macrobiotic section as well. Save money by purchasing nuts and seeds in the bulk section of the health food store. When I get home, I place them in mason jars - looks nice and keeps them fresh. Today I only had a 1/2 hour worth of treatments, so I basically had the day to myself. Today I finally reached my goal of walking 9 laps around the one side of the campus.I've been slowing building up the number of laps as I'm feeling stronger and better each day. I'm not sure how many miles that would be but I'm guessing about 5 miles because it normally takes me about 20 minutes to walk a mile and I walked for like an hour and 50 minutes with a stop now and again for water and green juice! Then spent the rest of the day resting, reading and hanging out in nature. Dinner was "light" consisting of a delicious salad mix they prepare with spring mix lettuce, sprouts and avocado all mixed up and you can put it in a huge raw collard green or a sprouted, whole grain flat tortilla-type wrap. I tried both when they had it last week and I preferred the collard green, so that's what I went with this week. And tonight was ice cream night, so that's a happy time around here! I went with the nut ice cream again since I'm not supposed to eat fruit and it was delicious. I think I have the recipe for it, but once again I forgot my recipe packets in my room, so I'll start posting soon! Tomorrow a bunch of us signed up to go to Chef Renate's house where she will be giving a raw food demo of a 4-course meal and then we sit down to enjoy the food she prepared. She's very creative so I'm hoping to get some nice ideas from her since I would love to be able to do that some day. My town house is not that big so I couldn't have quite so many people, but I think it would be fun. HAHA! The most amazing thing I noticed upon waking this morning is that I actually slept the entire night without being awakened by a hot flash! When I looked at the thermometer, the temperature in the room was 66 degrees! But still, no matter how cold a room is, if I have a hot flash, I'm still gonna sweat my balls off (yeah, I know, bad habit - listen, I never said I attended charm school). It's been YEARS since I've been able to sleep an entire night without being awakened by a hot flash (or night sweats) so that put me in a better mood than I was when I went to sleep last night - I was so worried and upset about the results of my hormone blood work, increased risk of heart disease and finances. Anyway, I've been having some weird dreams lately. I can't remember most of them, but the one I recall vividly had to do with my job. In my dream, the building where I work was located right near the ocean (hmmm, if that really would be the case, I might be ever so slightly tempted to stay so I could take walks near the ocean and get all the wonderful healing from the negative ions)! But anyway, back to my dream... so the building was located oceanside and there were tsunami-like waves heading our way. When they hit the building, it was kind of like an Irwin Allen disaster movie. Waves crashing against the building getting higher and stronger with each wave, over and over again until finally the windows shattered and the entire building flooded and the waves took people out to sea and demolished the building. Of course, I survived and I ran for my life. When I was finally in a safe place, I turned around to survey the damage and there was nothing left of the building or any people. Nothing but beautiful shore. I'll have to look up the meaning of this dream, although it's rather self-explanatory, don't you think? Oh well, one can dream, can't they? Anyway, on the way back from the Hacienda building last night which is where I'm able to get internet access, I stopped into the Juice building to make my wheatgrass for the night and another guest came in. It was late, but we ended up talking for 45 minutes and shared some really good, relevant information. I really have met some really wonderful people here. I came here thinking I'd had enough of people and I just wanted to be left alone to heal myself and my soul. I intended to go to classes, treatments and lectures and then just hang out alone in my room in my own little bubble. But I have to say the friends I have made here have enriched my soul as much as, or perhaps even more than, anything we have learned here. The same goes for many of the staff here. They care. And they're so darned NICE. And HAPPY. I've talked to a lot of the employees here about their jobs and they love what they do. And it shows. Several of them said that I should consider applying for a position here. Are you kidding me? If it wasn't so darned humid, I would say hasta la vista to my job back home in a heartbeat. So, I attended a Journaling class this morning. It was a very small class - just me and another lady. Like all the other classes I've attended, I got some good tips, like on a daily basis, you should make a list in your journal of everything you're grateful for. Kinda smart. But one part of the exercise left me bawling so hard, I couldn't even speak. We had to write a letter - it could be to a person, deceased or living, or to a pet, or whatever/whomever you wanted to direct this letter to. I of course, chose my pet, Peanut who passed away in 2007. I loved that cat more than life itself, more than I've loved anything or anyone ever. My letter basically thanked her for picking us to be her friends and caretakers and for loving and trusting us unconditionally. My life was made all that much better by her having been in it. There's not a single day that goes by without thinking about her. Anyway, we were supposed to read the letter out loud and I was crying so hard that I couldn't speak. That was a tough ordeal to go through this morning. Note to self: no more journaling classes! But as the day wore on, I realized that I was not having the hourly hot flashes I've been experiencing for several years! I mean, I have at least 1 an hour, sometimes 2 every single hour, all day and all night. It's been so bad that I, Miss Non-Medicine was contemplating taking some sort of hormone therapy (I wouldn't have, but the thought of not having these darn hot flashes made it tempting). I still had a few really bad ones today, but only like 4 all day and a few that were so light that I didn't even break a sweat. That alone, for me was a welcome relief. It was a really hot, humid day here again, but I went for a walk and am still feeling pretty darn good. I was going to post those recipes I mentioned in yesterday's blog, but I left the recipes in my room. I think tomorrow's going to be a light day, so maybe I'll post them tomorrow. We had the Better Than Tuna recipe for lunch today and it was beyond delicious. I'm so proud of myself - even though the food is really, really delicious, I have been excellent at just eating one serving and not going up for seconds. Yes, my plate is piled quite high, but it's mostly the sprouts and then just a little bit of the "entrees". I mean, when they had raw pizza last week, the sign said 2 pieces per person, but I just took one piece and I was satisfied. I've been known to go back for seconds and thirds and still be starving while my boyfriend is still on his first serving. Yeah, and then I would wonder why I couldn't lose weight! I gotta say, I have no idea what is going on news-wise. I heard something about an earthquake in Maine a couple of days ago, but I honestly have no idea of what is going on in the world outside of here and it doesn't bother me in the least. Although I am still missing my nightly King of Queens show. Today, I finally got brave enough to ask Viktoras Kulvinskas for a picture! He is so sweet, gracious and down-to-earth, I don't know why I was so terrified to ask! How lucky am I that I happen to be here at Hippocrates while he's here too?? And then, I got even braver and asked Brian Clement for a picture. Jeepers, go me! Brilliant man, if only he would run for president; president of the world, not just the U.S. The world would be a much better place to live, I can promise you that. Anyway, I think I'm gonna call it a night and I'll hopefully be back here tomorrow with some nice raw recipes! More Pilates today. I really enjoy it and plan to use some of the Pilates DVDs I have back home that have been gathering dust! 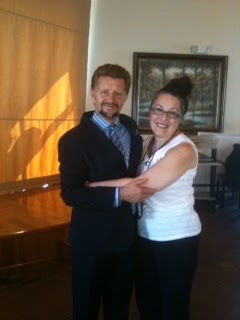 Another great lecture by Brian Clement today, Principles of Health. Unfortunately I had to cut this one short, because I had a doc appointment to go over the results of a more extensive, blood/hormone test I opted to get. As I suspected, my Vitamin D3 levels are way down which offers no protection against cancer. I was taking about 5000IU a day back home but haven't really taken them for a few weeks. He found that my blood is viscous (not good) and that C-reactive protein is rather high indicating inflammation throughout the body which puts me at risk of cardiovascular disease. He also found low progesterone and low estradiol levels among a few other things. The doc recommended assorted IV therapies to get me back on track to the tune of lots of $$$$. I mean, like $$$$$$$$$$$$$$. As much as I trust his advice and would dearly love to do this, I already spent a ton of moolah to get here in the first place and I just can't do it unfortunately. So he gave me a list of supplements to take which I'll get tomorrow and see if I can't fix the problems that way first. I'm also supposed to rebound 25 minutes a day, every day. He made a point of that. OK so that news didn't make me happy. I left there feeling very sad and scared. All the more reason to stick to the plan when I get back home. On a happier note, there was another Kitchen Techniques class today and Chef Ken showed us how to make the Nut Meatloaf we had earlier this week which was out of this world. And Chef Renate made a really, really delicious "Better than Tuna" recipe that was really, really delicious. Yes, I meant to say that twice! I would post the recipes, but I'm just about out of battery power, so I'm gonna have to call it a night. I'll post them when I can. Wednesdays are fasting days here if you choose to participate, so I just consumed liquids all day. Wheatgrass shot in the morning. Green juices and water throughout the day and a delicious blended green soup for dinner. Last Wednesday, I did the fast and didn't feel hungry at all. This week I was hungry, but not uncomfortably so. I would say it was more that I missed the delicious food more than anything because the food is truly wonderful here - I love it. But I feel good for successfully getting through the day without eating. 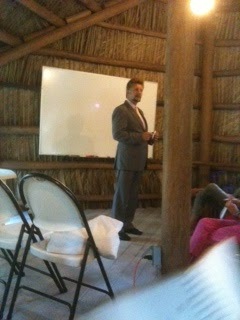 Today, Brian Clement (above) gave a lecture called "Fasting on Liquid Nourishment". He recommends doing a juice fast one day a week (he does it for two days a week). He covered a lot of information and I haven't sorted out my notes yet so I won't go into much here except for one important takeaway: You with purpose will save your life. You must have a purpose. Without that, you will die. If you have a terminal illness, no matter how much healthy (Hippocrates) food you eat, you will die if you don't have a purpose. Fear, anger, hostility and hatred are a major part of disease. When I get home and sort through my notes, I hope to someday be able to post some of the good info here. Later in the day, Anna Maria Clement (pictured above, left, along with a very happy me) gave a lecture on Ancient and Current Self Help Techniques. Lots of good info on how to treat various things such as earaches, wounds, tumors, headaches, detoxification, rejuvenation, etc. Again, so much info that I don't have time (or battery power) to type at the moment, but will do so at a later date. The evening lecture was about facial acupressure and the importance of exfoliating the skin, the entire body not just the face. As we get older, our skin doesn't shed the dead layers of skin so it accumulates and prevents the new skin from breathing properly. A daily skin brushing ritual helps with that and with stimulating the lymph which can't pump itself so relies on skin brushing to help. What everyone has been taught is to brush from the soles of the feet UP to the heart, from the arms to the heart, etc. But we learned that it's actually better brush toward the areas that contain lymph glands. So, for instance, start on the thigh about 3-4 inches from the groin area and brush up. Go down toward the knee and brush up. Go down to mid shin/calf, brush up, ankles/feet and brush up. Same idea for the upper body, this time brushing toward the lymph glands located in the arm pit area. There's nothing wrong with the dry skin brushing routine that most everyone knows, it's just easier to tell people to brush towards the heart, but to help the lymph do its job, it's better to brush toward the lymph gland areas. Of course, do not use chemicals on your skin, like parabens, petrochemicals, or anything that you can't pronounce or wouldn't put in your mouth. The skin will absorb any impure substances that you put on it, so use only organic, pure products on it. That goes without saying. On another note, I sat with a couple of people today who had been here before. One person in particular has been here 4-5 times. Now, this place isn't cheap. Far from it. So not only was I a little jealous, but then I was a little taken aback when they both said that right about now we should be feeling like we've had enough of this place now that we're about halfway through the 3-week program, and that we should be tired of the food, tired of the routine, feeling like we are ready to go home by now. They both said this.Yeah, not on my planet. I'm already trying to hold back the thoughts that have already been creeping into my consciousness that this is not going to last forever and that someday all too soon, I'm going to have to drive to that place where I earn a paycheck and climb those stairs to my cubicle and return to the dreaded dreariness that is my job. Just the vague thought of it has brought me to tears here, so I keep pushing the thought aside. So for these people to have the gobs of money required to do this program over and over again and then bash it in a sense... I don't know. I just don't get it. On a happy note, I got the results of my DEXA (bone density) scan back and my results were very good, in fact slightly above, other women in my age group. I also tried Pilates for the first time today and loved it! The special treat was an evening lecture, Enzymology by Viktoras Kulvinskas (pictured below). He spoke for nearly two hours solid without stopping. The man is beyond brilliant. He basically spoke about the importance of enzymes for life (systemic and digestive). I tried to take notes, but he spoke in such a rapid-fire manner, it was next to impossible to keep up. I recorded it on my i-phone, but I haven't listened to it yet (hopefully I was successful in recording it). Not much else to write about that I can think of, just went to a couple more classes including Organic Awareness and Growing Living Foods and a couple of vendor presentations including H Wave Therapy and Stem Cell Stimulation. Colonic: Colon hydrotherapy is a safe and painless treatment to remove debris and toxic waste build-up in the intestines, using only filtered water and disposable materials. A clean colon promotes overall good health. H-Wave Therapy: It is the only device recognized by the FDA as an anesthesia device. H-Wave gently and comfortably helps to remove the source or cause of pain for long-term pain relief. It helps to increase the circulation and assists lymphatic drainage which promotes homeostasis - the fundamental basis of all healthy living tissue and healing. Ondamed Biofeedback Treatment: Electromagnetic frequency device that offers a high specific biophysical analysis and application based on electromagnetic inductivity. Benefits include improvement in chronic pain, improved blood circulation, activation of lymphatic drainage, increased cellular repair and regeneration, body balancing, stimulation of detox and release of toxins and inflammation. Therapeutic Swedish Massage: Helps relieve everyday tension and stress by promoting the relaxation of tense, right and often sore muscles. It stimulates blood circulation and promotes elimination of toxins. Viofor: Electromagnetic therapy which improves the way your body functions. It makes the biological process more effective, enhances circulation of your blood to all parts of the body, increases oxygenation of tissues to fight infection and strengthen your immune system. Theragem: FDA approved Light Therapy System that supports the regenerative and re-balancing processes of the body. It also stimulates microcirculation, which speeds the healing process, the production of collagen, tissue projection and granulation for healing of ulcers, wound and inflammatory conditions. It stimulates the natural immune responses and lymphatic drainage of the body, supplying energy to stimulate the increase of RNA and DNA. MRS 2000: Magnetic Resonance Stimulation is electromagnetic therapy for improving metabolism, circulation, melatonin production, and metabolic system. MRS 2000 is beneficial for stimulation of bone cartilage, nerve recuperation, wound healing and alleviation of pain. MLD Bed: Manual Lymphatic Drainage bed simulates how the lymphatic system moves throughout the body. The gentle rocking motion assists the lymph in moving sluggish, stagnant fluids through the system for elimination. The effect of the increased circulation enhances the feeling of overall health. Turbosonic: Uses sonic whole body vibration therapy giving you a stronger body in 10 minutes. It is also an excellent way to boost your metabolism, stimulates cells, rejuvenates muscles and dissolves cellulite. Laser Q 1000: This laser is a hand-held state of the art laser device that offers attachments that can be applied to specific areas of concern. This dynamic and strong FDA approved technology helps to change the negative patters of physical disorder by activating biochemical and anatomical order. Laser L3 Electronics: Creates low level light enhancement generally used for whole body balancing and healing. When calibrated, it specifically works on soft tissue like muscles, ligaments, and tendons as well as all of the organ systems. On another setting, it assists hard tissue, skeletal, including teeth. Set on an even higher frequency, it provokes the body to neutralize toxic heavy metals and chemicals. In addition, by stimulating the immune system, it helps to reduce microbial activity. Except for the Colonic and Ondamed Biofeedback Treatment, one of each of the treatments included for each week of the stay. The Colonic and Ondamed are just one for the entire stay. The only one I'm not allowed to have is the Turbosonic treatment, due to my previous brain surgery. Too bad because it's supposed to help with cellulite. Oh well. Do I think they're working? I'm sure that they must be - I can honestly say while not 100%, I feel vastly better than I did before I got here. The hot flashes do still plague me, but I do notice they're less intense than they were and perhaps a little less frequent. Nails are still doing great, vision seems clearer and energy is very much improved. I attended a yoga class for the first time ever and did OK. I got a little tired after the first Sun Salutation, but after the first one, I sat it out while the group did the asanas 6 more times and I joined back in once they were done. Hey, I tried it. Viktoras was in the class and it was amazing beyond belief to see him do the Plow Pose. He folded so tight he looked like a clam shell. Then there was a class called Taking It All Home most of which I do anyway such as using glass Mason jars to store nuts and seeds and how to equip your raw kitchen most of which I have also with the exception of a dehydrator and a couple of Easy Sprout sprouter kits. But as always, there's always a fun new tidbit to learn. We learned how to estimate how much sprouts are needed for weekly usage which will come in handy. So for instance, to plan to order enough sprouts for the Hippocrates green juice which consists of 50% sunflower sprouts and pea sprouts and 50% cucumber juice and celery juice, for a single person, you would need to plan on ordering 3 1/2 pounds of each sunflower sprouts and pea sprouts. And then of course, sprouts are a big part of lunch and dinner, so you need to plan extra for that as well. So that brings the total up to 7 pounds of each sprout required for one person per week. I don't have my notes with me now, and I'm too tired to think, but I'm pretty sure that was the ratio. We eat a lot of sprouts around here! At the end of the class, we had a raffle and I won! I won a bottle of stevia! I felt so lucky like the time I took a random trip up to Becket, Massachusetts by myself to attend an open house at the Kushi Institute. I won a free brunch for two, but haven't had an opportunity to use it. I wonder if it's still good. Anyway, it was fun to win! 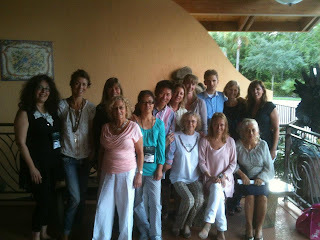 Today there were a lot of new faces around since a new group of people arrived yesterday. They seem alright but different than the great group of people I arrived. I mean, for instance on Mondays, Wednesdays and Fridays, you get to have 2 oz of Blue Green Algae to add to your 10:00AM green drink. They tell you this in orientation, they tell you when you have your consultation with your nurse and it's clearly and largely written on the pitcher: 2 ounces Blue Green Algae only. So one of the new guys filled his 8 ounce glass clear up to the top. One of his fellow newbies said 'Stop! Don't drink that much, you're only supposed to have 2 ounces!' With that, the cup filler proceeded to open the top of the pitcher and pour most of the Blue Green Algae back in the pitcher. I have no idea whether or not he had already drank from that cup, so no Blue Green Algae for me today and it's too bad because it's part of my "prescription". Oh well. I guess we'll get used to them. It's like when I went to the Kushi Institute - Level 1 takes a month to complete, but you can break down by week increments. Unfortunately, work wouldn't allow me to take the full month off, so I went for two weeks in the winter and two weeks later in the year. My first, original group was the best - friends I have to this day. The second group, I only keep in touch with one lovely girl. Same thing here, you get used to the people who have all been in this since day 1 with you. I had a complimentary H-Wave treatment today and I had an acupuncture treatment later in the day. I can honestly say that for a portion of the day, I had NO pain in my ankles although, later in the day I walked for about an hour and after that felt a little achy, but it's really humid again today and that sometimes makes me not feel so good. But nails are hard and growing fast! And my vision seems clearer. And I feel more sensitive when touching things. By the way, the H-Wave treatment I mentioned about uses a form of electrical stimulation and is mainly used in the management of pain. I'm not sure what other uses it's good for, but I have a class tomorrow so I'll find out more. One incredibly, amazing week has gone by. Today was Beach Excursion Day. In the morning I walked 3 laps on one side of the campus and took some pictures. Then around 11:30, we took a bus ride to a local raw vegan restaurant called Darbster. They aren't strictly raw, but they did offer 3 raw living entrees on the menu. 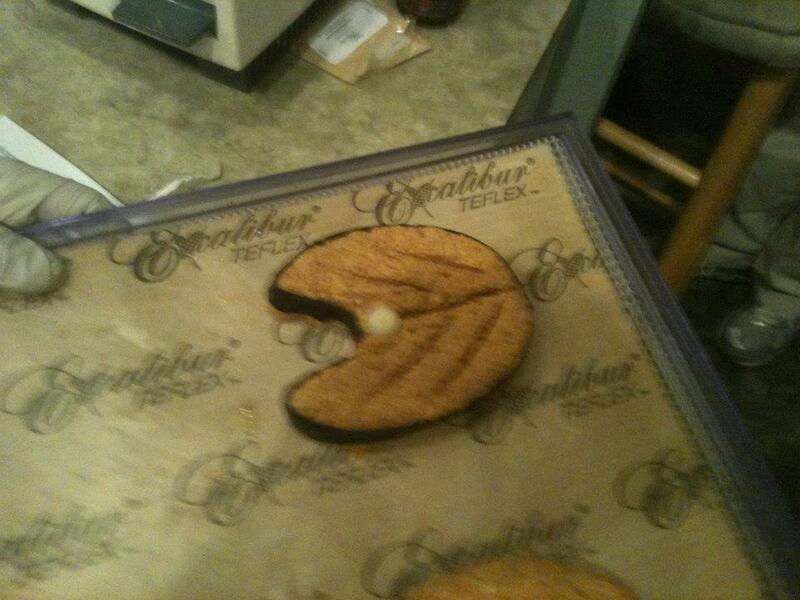 I split a Raw Cheezburger with a friend and it was quite nice. Then we went to a health food store called Nutrition Smart and had a member of Hippocrates lead us on a store tour to know what to avoid and what to get when shopping once we leave here. This was not too informative for me, but again, every now and then you learn a little tidbit I suppose. So Hippocrates does recommend some foods when you get back home provided they are an occasional treat and not an everyday thing, keeping in mind the 80/20 (80 percent raw, 20 percent cooked). For instance, Sunshine Garden burgers in the frozen section is OK; some of Amy's frozen entrees are OK (just read labels). Agave is not recommended at all. Bee Pollen is recommended unless you are vegan and prefer not to consume it. Anyway, the trip was fun. I bought a book that looked good "Transitioning to Living Raw Cuisine" by Rene Oswald. That was it. Then on to the beach. Ocean Reef Park in Palm Beach. I loved it. It was overcast (I never claimed to be normal) and the waves were strong and consistent, but some sun peeked through at times. I don't know, between the gray sky, the wind and the waves, I could've stayed there all afternoon, but alas, the lifeguard called people out so we left after a short while. 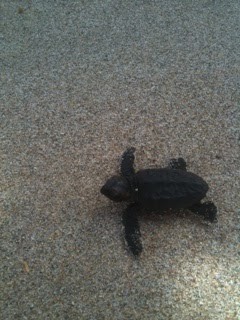 The highlight was watching a baby turtle make its way into the ocean. Cutest little thing I ever saw! He kept trying and trying to get into the ocean, but the wave would take him and then bring him right back. He finally made it in thanks to a friend that guided him in on a piece of algae. We all cheered the little guy on and wished him well! Back at Hippocrates, another wonderful dinner and finally some time to catch up on my posts! Easy, fun day. No lectures. I don't have the recipe for the ice cream but it was delicious - I'm not supposed to have sugar while I'm here, so I had the nut version which I believe was made from walnuts with some organic maple flavor (Frontier brand). It was outstanding. They also had a berry version which I understand was not sweet but still satisfying. And the hands-down winner was the banana ice cream. It looked wonderful and those of my friends that had it, couldn't say enough about the creamy texture and the sweet taste. Oh yes, I double did. OK, another read at your own risk disclaimer here! OK the day I've been dreading yet anticipating ever since I arranged this trip: colon hydrotherapy. Um, so it hurt and it was uncomfortable (for me since my body had a lot of gas due to candida and lack of or low beneficial bacteria - working on that here). It wasn't as embarrassing as I was afraid of and again, if I can go through brain surgery (and flying), I can pretty much do anything now. Lynn was knowledgeable and caring and in the end (ba-da-pum), I left feeling better than when I went in. It's something I would prefer not to do again, but the benefits are many so I surely will. Well, I would say no stone unturned now. No change in weight since I weighed in on Monday - 173, but as I mentioned that was still 4 pounds less than when I left home. No food cravings to speak of yet. In fact, I'm loving all the food here. Today's special was Raw Pizza and it was unbelievably good. The recipe was given to us in yesterday's Kitchen Techniques class so if anyone is interested, leave a comment or email me. I don't always have internet access here, but when I'm able to I'll type it up and send it whenever I can. My pain has virtually dropped from 15 on a scale of 1-10 (yes) to maybe 1, sometimes a 2 if I've stood in one place for too long without moving/stretching. The biggest thing here, I will repeat, is that everyone is happy and pleasant. And everyone greets each other. Even people with serious illnesses - if they're too weak to speak, at least they smile at you. BI/Corporate world, take a hint here - it doesn't take much to say Hi to someone. Peace. Another thing I've noticed is that my friends here seem to have come to life. Where Sunday-Monday-Tuesday, we were kind of off, not feeling well, pale, maybe detoxing, today, everyone seems to have a radiant energy thing starting (me included), and it's an incredible and amazing thing to see. So tonight was movie night - it's the only way we get to watch TV around here - to watch a pre-selected DVD. We watched "What in the World Are They Spraying?". It was an eye opener about the chemtrails in the sky (vs. airplane contrails). I highly recommend watching it and spreading the word, so people become aware. Just Google "owning the weather" too. My favorite day so far because there was a kitchen techniques class today. Chef Ken Blue make it all look so simple and yet he creates recipe masterpieces, that's all I can say. I haven't anything yet that I didn't like. Some of my friends here are having a tough time with the food, missing cooked food, missing noodles, but I'm happily enjoying everything! I'm finding too that my appetite has been decreasing. When eating regular cooked foods, I would often go back for seconds and thirds, but here I'm quite satisfied with a single serving. Today, my ankle definitely seems better - it was practically immobile when I first got here and now I'm able to rotate it no problem and I'm walking much better again. I'm also noticing that my nails are hard again and not brittle. Read further at your own risk! Part of the routine here is to do a water enema and 2 wheatgrass implants. And yep, I did my first ever enema and wheatgrass implants today. It's actually not that bad. In fact, you do feel pretty good after and I myself felt a small sense of accomplishment for doing something I knew was good for me, but not doing it because I didn't know how and was terrified of the process. I have all the stuff at home, but just couldn't get past the fear. Another gold star for me - the first MAJOR gold star was getting on that plane!! I was the same way with my pressure cooker - bought one and there it sat in my cabinet for the longest time because I was afraid to use it. I read the instructions a million times but just couldn't get past the fear. Finally, one day I made up my mind to do it and it was fine - done deal. You just gotta put your mind to it and do it. People need to be aware that airport x-ray machines are incredibly bad for us. You should always opt for a pat-down instead. I also recently heard that dental x-rays have been found to cause brain tumors. He also talked about water, the best type being distilled. The favorite brands that he mentioned are Smart Water, Fiji and Volvic. No one in my family believes me when I say microwaves are dangers. Yes, they are. If you have a wireless router in your home, it's best to unplug it at night. I'm also going to look into Scalar technology to protect my house from EMFs. Recently the public utility came to my townhouse to install a smart meter in the basement so the guy can just take a reading without getting out of his truck. I told him I didn't want it in my house and he told me that I "didn't have a choice." Can you imagine? It's insane. And people need to know that cell phones are dangerous and Blue Tooth headpieces are even worse. I ordered one for a boss that I didn't particularly like but unfortunately he was aware of the danger and didn't want it. Oh well. But seriously, if you need to use a cell phone, don't hold it to your head. Rather, use the speaker and hold it away from you. There have been increases in cancer located in the pelvic area of men who carry cell phones in their pockets; likewise, women who place them in their bra to carry around have been getting cancer more frequently in that region. There are studies that have found cell phone use increases brain cancer. Our government is withholding the fact that cell phone use causes cancer. 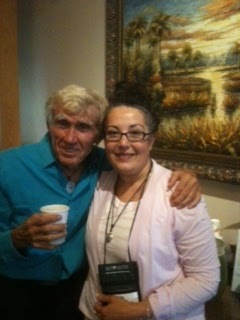 After Brian's lecture, I had a consultation with Dr. Anna Maria Clement - she is purely lovely and so knowledgeable and kind. What these two people have created here is simply amazing. If only the world had more people like the Drs. Clement! OK, this place must be working some major magic because I haven't dropped an F-bomb in three whole days, nor have I had the desire to! Back home, it was used in practically every other sentence! There are so many lectures, treatments, consultations and things to do (yoga, qigong, fitness center, meditation, Pilates, strength training, not to mention the Jacuzzi, the mineral pool, and the regular pool). There are so many beautiful paths to walk and little places to stop and just be with nature. I walked in a labyrinth for the first time. I'm not exactly sure what it's supposed to do; I think it's a time to meditate and be with yourself, but I tried it. It's hard to schedule everything in. Today I did some qigong which was OK followed by some meditation which didn't work so great for me because I have such sensitive hearing that I hear everything and I can't tune it out. So I could hear people talking outside, airplanes taking off and landing at the nearby airport and other people's breathing even distracted me, so that didn't work so well for me but at least I tried it. My blood test results showed a significant Vitamin B7 (biotin) deficiency, which would account for the brittle and splitting nails, the dull lifeless hair, fatigue, muscle pains, the tingling in my feet, and poor metabolism. The results also showed high cholesterol (198) which is unusual for me, but may be related to the B7 deficiency. Apparently this deficiency is very rare, but it's correctable. Everything else looked pretty good and within normal ranges. This evening Cherie Soria came to speak and do a raw food demo (Raw Zucchini Hummus). I saw her not too long ago in Catch a Healthy Habit raw food cafe in Fairfield, Connecticut but it was still good to hear the information again. She is 65 and could easily pass for someone in their 30s or 40s. Lovely lady. First thing today was having a blood draw, blood pressure taken and weight check. I was surprised by the weight because I was 177 when I left home, so already some improvement! Internal Awareness which all about our digestive system and the importance of colon health (enemas and wheatgrass implants and colon hydrotherapy). Wheatgrass Instruction which did not have too much new information for me since I have been doing wheatgrass shots on and off for a couple of years ever since I attended a lecture that Brian Clement gave in Fairfield but nevertheless they have electronic wheatgrass juicers here, so it was good to learn how to use them. I currently have a manual wheatgrass juicer and I kinda like it cause you get to have a mini arm workout while you juice. The afternoon consisted of back-to-back lectures. I don't have my notes here with me at the moment, so I can't write them all down right now. Additionally, it's actually Sunday night that I'm writing this since Internet time is so limited. But anyone who wants to know can shoot me an email and I'll be glad to share what the topics were or when I have time, I'll just update this post. A special treat was having the Wheatgrass Band play in the evening, of which Dr. Brian Clement is a member - he plays the drums. It was a rare treat to see him casual for once and not in a suit. 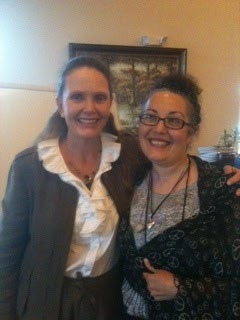 This evening was the first time I saw Dr. Anna Maria Clement in person and she absolutely lovely, gracious and angelic. And Viktoras Kulvinskas was dancing up a storm! The music was a little too loud for my sensitive ears so I grabbed my laptop and got to check emails until 9PM when the building closed. My room doesn't have wifi, so I'm having some Facebook and email withdrawal and there is one TV that I know of but only for DVD use. It's actually very wonderful and calming to not be aware of what's going on in the world (world news, local news, political campaigns, etc), but I gotta admit I'm really missing my daily dose of "The King of Queens"! No really bad detox symptoms for me except a little bit of a headache which I expected since I drink a cup of coffee everyday. I've come off caffeine a couple of times before, so I knew I was going to have to deal with that. That and the more intense-than-usual desire to withdraw into myself and be left alone but it's kinda hard when everyone is new and trying to get to know each other and socialize. But it was all good. Everyone is very nice and sweet and everyone actually says Hi when they pass by which anyone that knows me knows that's a bit of an issue for me at work where most people look right at you and look down to the ground and can't even mumble a simple Hi/Hello. They not only don't initiate it, but they also don't reply. Oh well. So up until Sunday morning, I was unbelievably calm, serene and OK with the thought of flying. About 20 minutes from the airport, I started freaking out, had trouble breathing and in general, wishing that I was taking the train from Penn Station to West Palm Beach. But we got to the airport and pretty much everything was a blur: checked in, said farewells to Dad and BF, went through Security and boarded the plane. In case anyone needs to know, titanium plates and screws in the skull do not trigger airport security alarms! Then after the boarding the plane and preparing for take-off, the pilot informed us that there was a delay since the mechanic found that the engines were leaking fluid and since he made note of this in his logbook, a supervisor had to come out and investigate. So we waited and waited and waited. Two hours during which time, I was devising a way to get off the plane and hop on a train. But I'm so glad I didn't do that. Yes, take-off was terrifying but at least I provided comic relief to my fellow passengers who were laughing at my quite visible shaking and crazed look of terror. But once the plane leveled out and went above the clouds, I was simply amazed at the pure beauty of the clouds from up above. Just pure white clouds as far as the eye could see and sometimes a little rainbow among them too. The clouds looked three dimensional like meringue. Incredible to me. Not that I will ever become a first class traveler but this trip wasn't bad at all! So landing in West Palm Beach, I saw palm trees in real life for the first time ever, some with coconuts way up high. I wonder, don't they ever fall down on top of someone's head? And everywhere you go there are the cutest little lizards scampering about. So cute! Definitely tropical weather here (yuck). When I left Connecticut / New York, it was 43 degrees; it was 82 degrees at 9:00PM that night and incredibly humid. So the purpose of this trip, Hippocrates Health Institute is everything I could have hoped for and more. 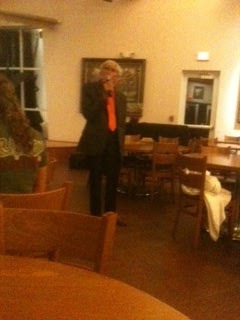 I even got to see Viktoras Kulvinskas in person in the dining room. Met some really neat people from around the world who all have one goal in mind: to reach optimal health. Everyone has a story, you know? Some very heart-wrenching and all with an incredible source of strength and will to live, get well and stay well. Everyone of us has been brought to this place at this time for a reason. I can tell this place takes caring for people very seriously and am so grateful for the opportunity to be here myself. Not much to report for Day 1. Basically got here late because of the mechanical problem with the plane, but I was able to have a quick lunch before orientation. The food was delicious, but I like eating that way anyhow. Everything was raw, organic, fresh, created with love and did I mention, delicious? Funny how food tastes delicious when someone else makes it, right? Anyway, our meals consist of sprouts because they're live, full of life-giving nutrients, vitamins, amino acids and minerals protein. The sprouts included: sunflower, pea, buckwheat, aduki, mung, lentil, radish, baby beet sprouts; and salads: spring mix, romaine, all kinds of veggies (cucumbers, zucchini, cauliflower, broccoli, and some mixture of zucchini and walnut salad that was out of this world good! The rule of thumb is that sprouts are the main dish and everything else is considered a side dish. Tomorrow blood work, blood pressure and weight check gets done to create a baseline, then more orientation and some lectures, qigong and dinner. Live, Love, Laugh... It seems like I haven't been doing much of those lately. Oh yes, I'm Living. Yes, I'm Loved (and love) and yes, I do Laugh. But not like I used to. I can't exactly pinpoint why. I blame a good deal of it on work and a great deal of it on the state of the world today. Unkindness to each other and abuse to animals, war, politics, destroying the planet little by little - it's all getting to me big time. I do my small part, but I still feel hopeless and sad, like I want to do more. I have a pretty good job, but I just feel so unfulfilled. For those that don't know, my dirty little secret is that I work at a big pharma company which is kind of a joke when I don't even believe in using allopathic or western medicine except in a dire emergency. When I meet people at various natural food / green / organic / good-for-the-earth type gatherings, I'm always met with a questioning head-tilt and raised-eyebrow (just one, sometimes both) when asked what I do for a living. With that said, I do earn decent moolah which has allowed me to pursue special interests such as becoming a Certified Holistic Health Counselor through the Institute for Integrative Nutrition in NYC and also enabled me to complete a month-long training at the Kushi Institute in Becket, Massachusetts to become a Level 1 Macrobiotic Counselor. Being at the Kushi Institute was one of the best experiences of my life thus far. Located on 600 acres of serene beauty in the Berkshires, it's a place that just feels right every time I go back. Lucky for me it's an easy and beautiful 2-hour car ride. And in less than 24 hours, I'm about to embark on my next Big Adventure... as I've evolved over the years, my interest in health and nutrition has never wavered. I still believe in the power of Macrobiotics, and now the more I read about the Raw Food Diet, the more sense it makes to me as well. The testimonials are compelling and I can attest that during the times that I adhere closely to a diet comprised of whole, raw foods, green juices and wheatgrass shots, I feel so amazingly healthy,vibrant and alive. It's difficult to maintain though when stress at work makes me reach for pretzels and candy and I find it hard to resist lunch dates at a local gourmet pizzeria. It's even difficult when I brown-bag it because for some reason, my co-workers can't deal with my healthy lunches and are quite vocal in their ridicule and disdain of my sea veggie snacks, green juices and even cucumbers! Yes cucumbers. Alas. As a health counselor and with all the reading I do, I know better than to reach for those unhealthy snacks and I know better than to allow the words of others to influence me. Not that their words hold meaning, but I don't need to spend 20 minutes of my 30-minute lunch time defending my food choices. It's just easier to eat by myself in my cubicle. As a health counselor I should also be able to maintain a healthy weight, but frankly that too, is out of control. I know what I need to do, but for whatever reason, I'm not able to do it and my health is suffering. I know I should exercise more and complain less, but I don't. Maybe the hormonal upheaval thanks to menopause is creating all this disruption in my life but I'm broken and I'm not able to fix this on my own. And so now I'm reaching out for help. Through the grace of a very understanding boss, I will be attending a 3-week health transformation at the Hippocrates Institute in West Palm Beach, Florida. I had wanted to go there for quite some time, but held off because of the cost and because I'm terrified of flying. But then the ball was set in motion after a particularly stressful day at work last February; not willing and not able to accept this feeling of just existing anymore, I finally picked up the phone and made the tearful call. It wasn't a question of IF I would attend, but rather WHEN I would attend; I could save up for this, but the major thing holding me back was my fear of flying. But I made the commitment then and would deal with the transportation issue later. As often is the case, serendipity performed its magic when a co-worker invited me to have lunch one day. We had passed each other in the hall often and chatted frequently, but we never had lunch together and didn't really know each other that well. She was due to go out on medical leave and so the topic of surgery came up. I could totally relate to her concerns as I had undergone surgery to remove a brain tumor several years ago. Consider yourself fortunate if you have never had to go through something like that (even the most routine surgeries involve some measure of risk, but imagine having your skull opened up and your brain tampered with)! It was by far the most frightening experience of my life. And so, when the topic changed from surgery to vacations, I told her about my plan to go to the Hippocrates Institute by train. It's a 23 hour trip, fine by me but not for my job (three weeks is a long time and I'm glad to have gotten that, so to ask for an additional two days was out of the question). Her words, "Ali, if you can go through brain surgery, you can fly on a plane - it's a piece of cake in comparison" really hit home. So, now I'm really leaving my comfort zone behind and flying and going further from home than I ever have before! I plan to come back a whole lot wholer than I am now. I want to be able to actually show people that this works by using myself as an example. I plan to return as a happier, clearer, lighter and more radiant version of my current self ready to have the courage and confidence to change the things in my life that don't serve me and to show people that it can be done. I want to come back to live not just exist. I do know it works thanks to the many people I admire including Dave Conrardy - The Raw Food Trucker, Dan McDonald, Cherie Soria and Lisa Wilson of the Raw Food Institute, Philip McCluskey (I had the pleasure of meeting all this year!!) and all the online friends that I follow, such as Angela Stokes-Monarch, Diana Stobo and Rev. George Malkmus (The Hallelujah Diet), not to mention the many real-life friends I have met through a local raw food cafe in Fairfield - real people who have overcome real health challenges. I want to add myself to the growing list of people who are changing lives (their own and others) through the power of whole, raw living foods. Wheat grass shots and healing, here I come! I'm anxious about leaving family, friends and pet behind but I can't wait to just BE. To not have to be "on" eight hours a day everyday, to just let go, take care of only myself, to not have to deal with traffic and rude drivers, noisy neighbors and cigarette smoke, to go on a news fast, to detox and cleanse both body and soul. Drama, I'm putting you on hold for a while - I've had enough. I'm looking forward to learning and living among like-minded people. I plan to chronicle my journey on this blog, so I can have a record for myself and share what I've learned and experienced with others, so please feel free to check back. I'm a Wallflower... I Don't Like to Dance! So, everyone is different... that's what makes the world go 'round, right? I don't like to dance and that seems to be a problem for some people and I'm not exactly sure why. I don't get it. That's not to say that I have never enjoyed dancing. Hey, back in my 20s, I could head-bang with the best of them on punk rock nights at a local bar. My best friend, Suzanne and I and our friends, Marcus and Kevin would highlight and spike our hair, dress in black and frequent a bar every Wednesday night which was punk rock night. It was a popular disco and I think it was called The Cuckoo's Nest (which no longer exists), but one night a week, they played punk music. Back then I could also get blitzed. I can't do that anymore. Well, I could but I'm not willing to endure the hangovers anymore. At any rate, I haven't danced in like 25 years and while I'm completely happy to sit there and "people-watch" and enjoy the music, I just don't like or want to dance myself. And for some reason, this is unacceptable to a great many people which has resulted in ruining many otherwise pleasant evenings for me. Every year, I get incredibly stressed out at the prospect of attending my boyfriend's company holiday party because I know his boss will inevitably ask me to dance. He doesn't take no for an answer. Picture me sitting at the table, eating dinner and catching up with old friends... or should I say TRYING to catch up with old friends because the music is usually blasting so loud that we can't hear each other and within ten minutes, my voice is hoarse from shouting. And I'm on edge because I know (I KNOW) the boss will come over at any time to ask me to dance or to harass my boyfriend into getting both of us on the dance floor. I have tried avoiding eye contact; I have tried to politely say "no thank you" a gazillion times. I've tried gripping my chair for dear life with one hand while my other arm is being pulled out of its socket by this person who is refusing to just let me be. Why does it have to be that way? What compels people to behave that way? Why can't I sit and eat my dinner and chat with friends if that's what I choose to do?? Why can't I just sit there and watch other people dance? It's rather amusing and I enjoy it, you know? I feel bad because I'm sure my boyfriend is appalled by my behavior. Heck, I'm appalled by it! Who would want to be in a situation where they have to forcibly wrest their arm free from someone's grasp? Geez! What people don't realize is that there might also be reasons why a person might not want to dance. Personally, I'm always hot (it's the menopause thing) and it's very uncomfortable for me to sit in an adequately air-conditioned room most of the time (unless it's about 50 degrees), but to add a physical activity such as dancing in close proximity to other hot, sweaty bodies - yeah, that doesn't work for me. I've also had joint pain and trouble walking and have taken to using a cane when the pain has been excruciating. At 51, using a cane to walk around is humbling. I've had to use it a few times at work recently and it's not fun. You feel old and you have to field approximately 50,000 questions from curious people who mean well and want to know what happened. It gets old. So when I attended a wedding recently, I didn't want to bring the cane not only because I didn't want to alarm family and friends, but I didn't want to answer the 50,000 questions, so I left the cane home. And then came the dreaded dance invitations. Between the loud music, the painful joints and the humid weather... well, you can imagine. To the enthusiastic social dancers out there...Listen, maybe some people are shy. Maybe they are embarrassed. Maybe they can't/don't drink enough to leave their inhibitions behind. Maybe they have cramps, a headache, they just don't feel well. Maybe their shoes hurt. Maybe they just don't like to dance - not everyone does. Whatever! SO WHAT?! There is nothing wrong with that - just leave them alone. They're not bothering you, so don't impose your will on them! If you like to dance, great. Enjoy yourself, have a fantastic time! But for crying out loud if you ask someone to dance and they politely say "no thank you", please just let it be. I mean, maybe ask a perfunctory "are you sure" if you sense the person is just being demure and has a grateful glimmer in their eye while looking hopefully at the dance floor, but if they say "no thanks" again, are avoiding eye contact or scurrying to the nearest exit, please don't cross-examine them or harass them and for Pete's sake, please don't grab their arm and rip their shoulder sockets out. Come on! I guess I'm passionate about this because I try to respect everyone's feelings and so it amazes and baffles me when people become so overzealous about dancing. I don't see why I have to put myself in a situation that gives me no pleasure - not everyone likes to be out of their comfort zone. I'll admit it - I'm an introvert. Big time. Whenever I've been subjected to team-building exercises at work to determine the balance between extroverts and introverts, I'm always at the extreme end of Introvert. Being in social situations, family gatherings and even being around people at work everyday is torture for me. If given the choice of going to a party or staying home alone with a good book, I will always choose the book. I don't mean to be mean and I don't mean to offend. It just is what it is. Am I weird? Perhaps. But at this point in my life, if something doesn't make me happy, I'm not doing it no matter how much I'm bullied. So, yeah, I'm a wallflower, I don't like to dance; it's just not my thing and I'm alright with it. Honest! I crave this salad! The variations are limitless depending on what produce is seasonal and available. Today I had a small yellow summer squash, so I used it. Other times I might use cucumber, fresh peas (you could use frozen peas too - just rinse briefly under cold water to thaw), red pepper, tomatoes, fresh raw corn just off the cob. Here's how I made it today. To prepare Kelp Noodles: rinse according to package directions and drain in colander. The kelp noodles are long and kind of unruly to eat, so I use a clean pair of scissors (reserved for food use only) to cut them in to smaller, easy-to-manage pieces (2 inches or so). Place the cut kelp noodles in a medium bowl and squeeze lime or lemon juice over the noodles and toss to coat. Set aside to marinate while you prepare the Kale Salad. Rinse the kale and drain. Remove the tough stem. Stack several leaves at a time and slice into thin strips (1/4 inch strips). Place in a large bowl. Add the garlic and sea salt and massage/knead the kale for a minute or so. The leaves will turn a brighter shade of green and soften. Add the lemon juice, olive oil , and tamari and massage into the kale too. Add the chopped avocado and massage in also until some of the avocado is mashed into the kale, but little bits are still visible. Stir in the onion and green onion and summer squash. At this point, you may also add what ever else you like in any amount you like. In previous salads, I have used combinations including a chopped cucumber, a cup of peas, 1 diced carrot, a cup of cherry tomatoes cut in half, fresh corn sliced off the cob, 6-8 romaine lettuce leaves sliced thin, etc. I find I don't have to adjust the amount of flavoring even with these additional ingredients - the lemon juice and olive oil seem adequate for me, but feel free to add more if you like. Presentation: Place the kelp noodles on a plate. Top with kale salad. Garnish with arugula and hemp seeds. *Besides offering a subtle nutty flavor, hemp seeds offer some nice nutritional benefits. High in digestible protein and all nine essential amino acids, hemp seeds are also known to provide a good balance of Omega 3 to Omega 6 fatty acids. I keep some in a glass jar in my freezer and sprinkle on my salads and soups. I have been making this cake for close to 15 years - it's my boyfriend's favorite. So much so that several years ago when I was diagnosed with a brain tumor that required surgery to remove it (or as I so bluntly say "cracked my head open like a coconut"), I made sure he had the recipe in the event something happened. A bit morbid, I know, but that's how I roll! Luckily, the surgery went well and I'm still here to make it! It's a wonderful recipe - easy to make and delicious and the house smells great while it's baking. To give credit where credit is due, the recipe is from Taste of Home Magazine - a wonderful publication (and website). Toss the blueberries with the cinnamon and lemon juice in a greased 8-inch baking dish. In a small bowl, combine the flour, sugar and baking power. Stir in the milk and melted butter. Spoon over blueberries. Whisk together the sugar and cornstarch. Sprinkle over the batter. Slowly pour the boiling water over the entire thing. Bake at 350 degrees for 45-50 minutes or until knife or toothpick inserted into cake comes out clean. 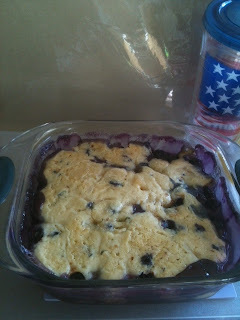 Note: If using frozen blueberries, do not thaw - this avoids staining the batter! This is my favorite juicer. Do not be deceived by the word "slow" in the name. The time it takes to juice is comparable to my other centrifugal juicer and the main reason I love the Hurom is that I don't have to stop every few minutes to clean out the pulp that gets caught in the screen. It does a nice job of juicing any veggies, leafy greens and fruits. Clean up is easy. I can't say enough about it! I saw this somewhere on the Internet and thought, Why not? This juice is sweet and refreshing on a hot summer day. And it's so easy to make (one ingredient)! One large cantaloupe yields about 4 cups of juice (I use a Hurom Slow Juicer). It's a great source of beta-carotene, which converts to vitamin A once it's consumed - important for good vision, lung health and cancer prevention. Cantaloupe is also high in vitamin C. Be sure to wash your cantaloupe before you slice it, as bacteria can form on the surface and contaminate the fruit as the knife cuts into it. Cut in half and scoop out the seeds. Remove rind. Cut into chunks to fit in the feeder of your juicer and juice away! I love this soup! 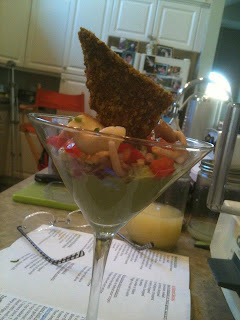 This recipe is inspired by one of my favorite raw food chefs, Diana Stobo. Blend all of the above in a high speed blender. Makes 1 large serving or 2 regular servings. Boil the beets until fork tender (approx 50 minutes depending on size). When done, let them cool in a colander. While the beets are boiling and then cooling, prep the garlic, onion, prunes and walnuts and put everything in a large bowl. When the beets are cool enough to handle, trim top and root and peel. Grate them into the rest of the ingredients in the bowl... I suppose you could use a food processor, but I like to use my box grater; it's an opportunity to slow down, chill and think about things. Add sea salt and mayo. Add freshly ground pepper to taste.